A total hip replacement is a surgery to replace a diseased or injured hip joint. 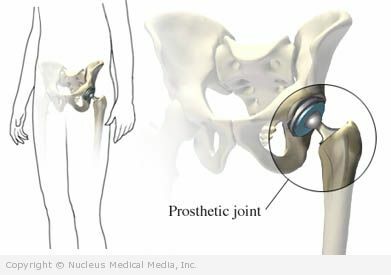 An artificial ball-and-socket joint is inserted to make a new hip. The artificial joint is called a prosthesis. This surgery is done when pain and stiffness limit your normal activities. This pain and stiffness is usually due to arthritis. Surgery is done when other treatments have been tried and are no longer working. These other treatments include rest, medicines, and physical therapy. Within six weeks, you should be able to resume normal light activities. A replacement hip typically lasts 10-15 years. Infection (eg, urinary tract infection, gum disease) — Having an infection increases the risk of bacteria entering the bloodstream and infecting the joint. Install safety bars, a raised toilet seat, a shower bench, and hose. Install handrails on stairways and steps. Buy items to make daily activities easier (eg, reachers, dressing aids). Your doctor may suggest donating your own blood for the surgery. You will most likely lose some blood and fluid during this surgery. If you need a blood transfusion, the doctor can use your own blood. If you smoke, try to smoke less or stop smoking. Eat a light meal the night before the surgery. Do not eat or drink anything after midnight. If you have diabetes, ask your doctor if you will need to adjust your medicine. General anesthesia will be used. It will block any pain and keep you asleep through the surgery. It is given through an IV in your hand or arm. The doctor will make an incision along your joint. The muscles will be moved aside. The damaged bone and cartilage of the hip joint will be removed. The doctor will then prepare the remaining bone for the prosthesis. The new plastic and metal joint will be placed in position. 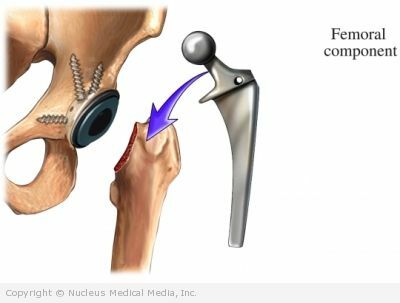 Depending on the type of prosthesis, the doctor may use bone cement to hold one or both parts of the artificial hip firmly to your bone. Lastly, the incision will be closed with stitches or staples. This surgery may be done with one or two incisions. For both types, special tools are used that fit into these small incisions. In some cases, x-rays will be used to help guide the doctor. For the one-incision surgery, the doctor will make an incision over the outside of your hip. The doctor will move the muscles and tendons out of the way. Next, the damaged bone and cartilage of the hip joint will be removed. The doctor will prepare the remaining bone for the prosthesis. The new plastic and metal joint will then be placed in position. Depending on the type of prosthesis, bone cement may be used to hold the artificial hip in place. Lastly, the incision will be closed with staples or stitches. In a two-incision surgery, the doctor will make an incision over the groin and another over the buttock. The above process will then be followed. Hip replacement – How Long Will It Take? Hip replacement – How Much Will It Hurt? You will have pain after the surgery. Pain medicine will be given to help with pain. Your doctor may choose to keep you longer, if complications arise. In some case, you may need to stay in a rehab unit. The focus will be on regaining function. Walk with help, using a walker, on the day after surgery. Be careful. A fall can damage or dislocate the new joint. Do not try to walk without help. Take medicine to prevent blood clots. Breathe deeply and cough 10-20 times every hour — This will decrease the risk of fluid build-up in the lungs. The fluid can cause pneumonia. Keep the incision area clean and dry. When seated, place a V-shaped pillow between your legs. This will help you to maintain correct positioning of your hip. Only take medicines recommended by your doctor. Do not take over-the-counter remedies without your doctor’s approval. Inform your dentist of your surgery. You may need antibiotics for some dental procedures. This will decrease the risk of bacteria entering the bloodstream and traveling to the prosthesis. Maintain a healthy weight. Obesity can increase wear on your new joint. In case of an emergency, call for medical help right away.